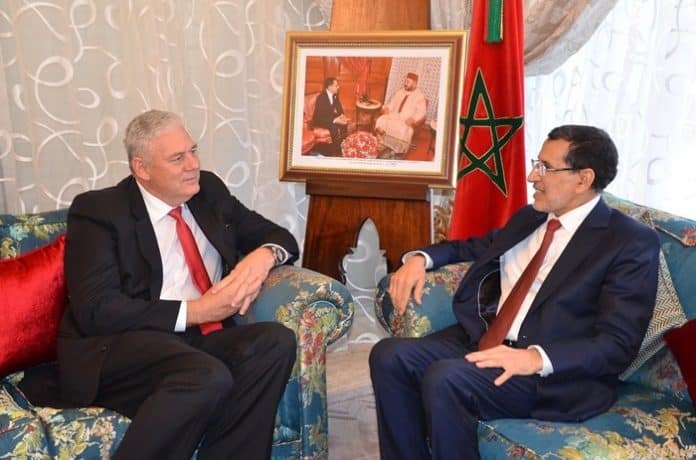 OECS Organisation of Eastern Caribbean States : Morocco and Saint Lucia to Deepen Cooperation on Agriculture, Tourism and Exchange of Expertise - The Maghreb Times ! Monday, November 20, 2017 – Organisation of Eastern Caribbean States (OECS) Chairman and Prime Minister of Saint Lucia, Honourable Allen Chastanet, met with Morocco’s Prim…. Monday, November 20, 2017 – Organisation of Eastern Caribbean States (OECS) Chairman and Prime Minister of Saint Lucia, Honourable Allen Chastanet, met with Morocco’s Prime Minister, Honourable Saad-Eddine El Othmani, on November 11th 2017 to discuss deepening diplomatic and economic relations with Saint Lucia and the OECS. The two leaders spoke of the establishment of an OECS Embassy and the signing of financial treaties. Investment in the Caribbean was also high on the agenda, with special attention paid to Agriculture, Agro-processing, Tourism and the exchange of expertise. The OECS Commission, along with foreign affairs ministers, is expected to meet early in the new year with Moroccan officials to formalize arrangements. The Embassy of the Kingdom of Morocco was established in Saint Lucia in March 2014 and covers all OECS Member States, as well as Barbados, Jamaica, Trinidad and Tobago, and the Bahamas.